FROM RickeySmiley.com -- Tempie Strickland, an 80-year-old woman was arrested in Fort Worth, TX on Sunday, November 10th after she allegedly tried to kill her ex-husband/roommate during a fight about him staying out too late. Rickey Smiley became aware of the story after the story was sent to him via social media. What moved Smiley the most was Strickland herself, because when she was asked in an interview how long she would be behind bars, she didn’t know if her last days alive would be devoid of freedom. Smiley says, “It broke my heart,” and added that everyone deserves due process. Rickey Smiley came to Tempie Strickland’s rescue by posting the necessary bond money (originally set at $100,000), and now Tempie Strickland has been released from custodyTempie Strickland initial charge of attempted murder has been reduced to aggravated assault with a deadly weapon. Rickey Smiley spoke to Tempie and her lawyer this morning on “The Rickey Smiley Morning Show.” Smiley told Tempie that he will join to support her in court and wants to make sure that she’ll have a “happy and peaceful” life. For full audio and quotes visit RickeySmileyShow.com. RICKEY SMILEY: The Rickey Smiley Morning Show. Eight minutes, eight minutes after the hour. Yesterday, well, Ebony, y’all wanna give ‘em the update? EBONY STEELE: I sure can. Yes, yesterday we told you about an 80 year old woman who was in jail in Fort Worth accused of trying to kill her ex-husband, Tempe Strickland. She was arrested Sunday night for allegedly pointing a weapon at her ex-husband who still lives with her. Now, Ms. Strickland says she was simply trying to scare him because he’d been staying out late. So police even are saying that Ms. Strickland’s ex, he doesn’t want to press charges, but they had to arrest her because the case is considered domestic violence, and Rickey Smiley came in and you can finish the story from there. 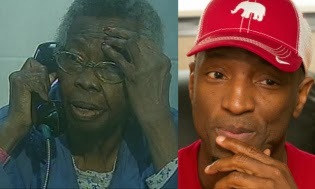 RICKEY SMILEY: Yeah, and I just saw her and, naturally thought about my grandmother and just kind of reminded me of my grandmother and my great-grandmother a little bit, and the fact that she don’t have any family. I don’t care what the charges are, because I wasn’t there and who are we to judge. And all these people jumping on Facebook saying stuff or whatever. You keep living and when you turn 80 years old and your nerves get bad and you on medication and you don’t have family and you get irritated and let’s see what you do when you turn 80 for everybody that’s out there judging. You know, the Bible says; Judge Ye Not. My whole goal was to get her out of jail until she have her due process in court. That’s fair. And that’s what it’s all about. So is she all the phone? RICKEY SMILEY: Ms. Strickland? Can you hear me? TEMPIE STRICKLAND: Yes, I hear you. RICKEY SMILEY: Hey, Ms. Strickland. Good morning. RICKEY SMILEY: Hey, this is Rickey Smiley. TEMPIE STRICKLAND: I don’t know you, I don’t think. RICKEY SMILEY: That’s okay. That’s okay, I know who you are. TEMPIE STRICKLAND: You do? Everybody else do too. RICKEY SMILEY: Yes, ma’am. Yeah, we know who you are. We was concerned about you, Ms. Strickland, that’s why we wanted to get you out of jail. You happy to be home? TEMPIE STRICKLAND: I am happy, very happy. RICKEY SMILEY: Yes, ma’am. So how you feeling? You excited? What have you been doing since you’ve been home? TEMPIE STRICKLAND: No, I’m not excited, I’m still worried about it and I look like I’m dying. I was sick before all this happened and I look like I’m about to fade away. RICKEY SMILEY: No, don’t say that. TEMPIE STRICKLAND: Working on me and I’m 80 years old. RICKEY SMILEY: Yes, ma’am, and you look good too. TEMPIE STRICKLAND: I don’t, I don’t look so good on TV. RICKY SMILEY: Well, that’s okay. Ms. Strickland, you look good, you look like you’re about 65. TEMPIE STRICKLAND: Well, I’m 80. I’m looking this morning like they need to bury me. EBONY STEELE: Don’t say that. RICKEY SMILEY: Don’t say that. Well, Ms. Strickland, this is what we gonna do. We gonna make sure that you represented in court and, you know, don’t worry about this case and stuff, so. RICKEY SMILEY: So don’t, I just don’t want you to worry, just – I just want you to know that you ain’t thrown away, and that you don’t have to have family for somebody to just love you and just care about you. Okay? TEMPIE STRICKLAND: Thank you very much. RICKEY SMILEY: Yes, ma’am. You more than welcome. I’m gonna be calling your attorney, I’m gonna be talking to him and we gonna do everything we can to make sure that you, that the rest of your days on earth is pleasant and full of peace. TEMPIE STRICKLAND: Okay, thank you. RICKEY SMILEY: Yes, ma’am. Now, what are you doing for Thanksgiving? TEMPIE STRICKLAND: I don’t know – good morning. TEMPIE STRICKLAND: I don’t know exactly because I got people that’s seeing about me, and so you, damn, I don’t know, I can’t think real good, all this torment and all and 80 years old. TEMPIE STRICKLAND: So I don’t know too much about anything right now, and I don’t have no family here. So I got church members that’s helping me. RICKEY SMILEY: Okay. Well, you make sure you get plenty of rest and we gonna, we your family, we gonna be your new family, so when I get a chance I’m gonna come see you. EBONY STEELE: And Mr. Lyons too. TEMPIE STRICKLAND: Okay, I appreciate that. EBONY STEELE: Her attorney, I think we have him on the line. Mr. Lyons? MR LYONS: Good morning, Ms. Strickland. RICKEY SMILEY: Hey, what up, bro? MR LYONS: How you doing, buddy? TEMPIE STRICLAND: Now everybody’s on the phone. (Laughter) We got 15 people on the phone this morning. MR LYONS: How’d you sleep last night, Ms. Strickland? TEMPIE STRICKLAND: Okay, I want to hear from all of you. The Lord is blessing me, thank the Lord. RICKEY SMILEY: When she have her court date, I’m coming, I’m coming, I’m gonna go to court with y’all. TEMPIE STRICLAND: Okay, I don’t have but one lawyer right now. TEMPIE STRICKLAND: I only have one lawyer. MR LYONS: We’ll talk about some of that off the air. Right now what we’re trying to do is kinda play this down a little bit, take some of the air out of the room, we don’t want this to be looked at her not taking this serious. MR LYONS: And hopefully the District Attorney’s office will look at this based on some of the information I advised them and then I’ll go forward. But we don’t want to compromise that right now. MR LYONS: I knew that, I knew that you did. And I thank you, I thank you for posting the bond. We had several people step up to post the bond and by the time they got there y’all had already done it. She appreciate that. I’m sure she slept very well last night. And she really thanks y’all for doing it for her. RICKEY SMILEY: Yeah, we blessed to be a blessing, bro. You know the poem, See It Through. MR LYONS: See It Through, right. 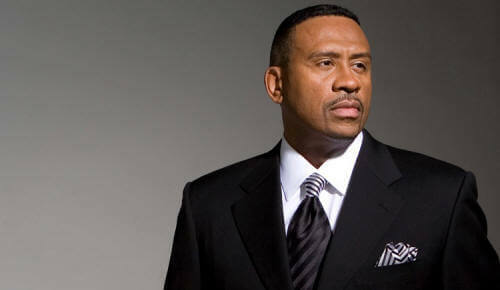 RICKEY SMILEY: Yes, sir. So when she have her court date, if you need me to come, you know, I’ll get on the plan, I’ll be there. MR LYONS: And I know that. RICKEY SMILEY: And, bro, let me get your number. Anything Ms. Strickland need as far as her necessities and food, and medicine or whatever, you know, I don’t like for any senior – you know, a lot of time we get so busy and get so caught up in our stuff we forget about people like Ms. Strickland that have paved the way for us to have what we have. And I might not be able to help everybody, but if I can just help somebody then my living won’t be in vain. Bro, it’s the right thing to do. I want to make sure that the rest of her days here on this earth that she have peace, food, medicine and any and everything that she needs, and whatever, because she don’t need no drama in her life. I was raised by a beautiful and wonderful elderly old black ladies and my grandmothers and my great-grandmother was awesome and she is every bit of all of them. And that’s what it’s all about. So we gonna make sure she straight, bro. And I really appreciate you. MR LYONS: I appreciate you, I do. And that’s one of the things that I’m trying to avoid. I mean, y’all will be there for her after this is over. A lot of people once they get the marketing out of this, they’re just gonna dump her and we’re not gonna let that happen, dog. EBONY STEELE: And she reminds me – anybody can identify with older people in their family, grandmothers, aunts, so that’s why The Rickey Smile Morning Show does this kind of thing. And if you want more on the story, or more information about Mrs. Strickland, you can go to the RickeySmileyMorningShow.com, for more information, good job, Rick.